The Enviro EF3Bi insert and zero clearance fireplace is equipped with a double row heavy duty heat exchanger and a large convection fan for efficient heat transfer around the home. The Enviro EF3Bi insert has been around for a long time, with a good reputation for reliability. This insert is simple and easy to maintain. It has a long burn time on the low heat setting. Height 22.9 in. zero clearance fireplace 24.6 in. 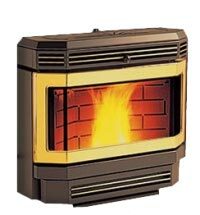 The Enviro EF3Bi insert is an inexpensive, reliable pellet fireplace with a good heat output. This unit has a smaller ash pan than the freestanding stove which will have to be emptied more often. Although a zero clearance fireplace doesn't need a fireplace and chimney, a false chimney breast will have to be built to accommodate the back of the unit. This doesn't need to be the full height of the wall. The exhaust pots are easy to access and clean. If you would like to leave a review of the Enviro EF3Bi insert, please use the form on the contact page.